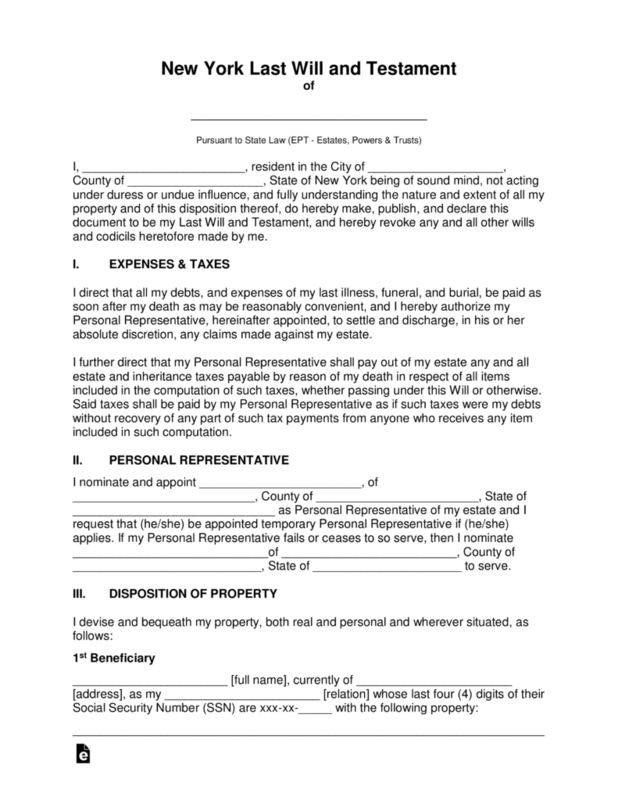 The New York Last Will and Testament is a document that is set forth by a testator to provide their wishes with regard to exactly how they would like to see the distribution of their estate to be carried out upon their death. The document will reflect the desires of how their family continues to be cared for in their absence by proper distribution of fiduciary, real estate, personal and other forms of property. This same document may provide for selected organizations, educational institutions, friends and others. The document, upon completion must be witnessed and signed by two witnesses, as well, all signatures must be acknowledged by a state notary public. This document may be changed or revoked at the discretion of the testator. Guide – Frequently asked questions and a guide to writing a will for New York residents. 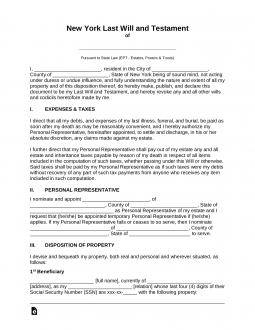 Signing (Section 3-1.1) – Signed be at least two (2) Witnesses who shall attest to the testator’s signature within 1 thirty day period and shall affix their residence addresses at the end of the will. Step 7 – Notary Public –The remainder of the document, once all signatures have been witnessed, will be completed by the notary as required.